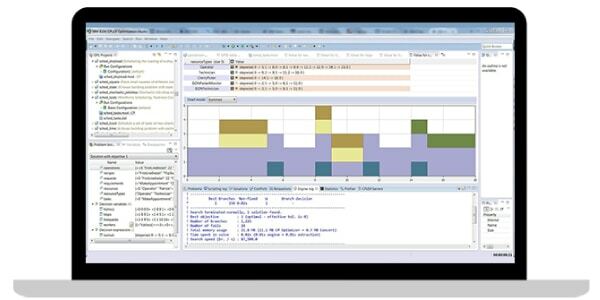 IBM ILOG® CPLEX® Optimization Studio is a comprehensive toolset for modeling and solving optimization problems. It consists of an integrated development environment for optimization modeling, powerful optimization solvers, and APIs for embedding optimization solutions. Create a project from an example. Review the input data and optimization model. Solve the model and review the engine's output. What can CPLEX Optimizer do for business? Model business issues mathematically and solve them with powerful algorithms from CPLEX Optimizer, which can produce precise and logical decisions. The mathematical programming technology of CPLEX Optimizer enables decision optimization for improving efficiency, reducing costs and increasing profitability. CPLEX Optimizer provides flexible, high-performance mathematical programming solvers for linear programming, mixed integer programming, quadratic programming and quadratically constrained programming problems. These solvers include a distributed parallel algorithm for mixed integer programming to leverage multiple computers to solve difficult problems. What is the best plan for my factory to meet the demand for finished products, while minimizing machine setup costs and factoring in scheduled arrivals of raw materials? How can I optimally assign marketing campaigns to customers by considering predictions around customers’ propensity to respond and maximize expected purchases, while fitting the budget constraints? CPLEX Optimizer delivers the power needed to solve very large, real-world optimization problems, and the speed required for today's interactive decision optimization applications. CPLEX Optimizer has solved optimization models with millions of constraints and variables. Build and deploy optimization applications using interfaces like ILOG Concert® Technology and CPLEX Callable Library. Read about performance improvements with CPLEX mathematical programming and constraint programming solvers. Linear programs can be modified, then solved again, in a fraction of the original solution time. Mixed-integer programs can be modified and solved, starting from a pool of prior solutions. Optimize your business decisions, develop and deploy optimization models quickly and determine the best course of action to improve planning and scheduling outcomes. Combine optimization techniques with other data science capabilities in IBM Watson® Studio to drive reliable business decisions. Build, deploy and use optimization-based decision-making applications for the enterprise. Solve complex optimization problems by using optimization engines deployed on the cloud with this easy-to-use, self-service solution. For mathematical optimization problems like MIP/MIQCP, users of IBM z/OS® can use CPLEX Optimizer with C and C++ APIs to model and solve their business problems. Solve multi-objective problems with CPLEX: Hierarchical, blended or combinations of both. Create and run an optimization model in Python. Experiment with the docplex Python API. Transform business decision-making with IBM ILOG CPLEX Optimization Studio. Learn how you can use CPLEX Optimizer for linear programming.